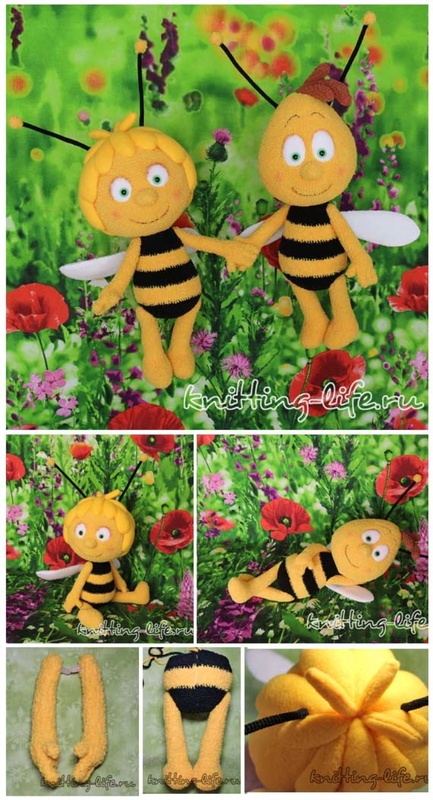 We offer you to please small cartoon lovers and to connect the well-known heroes of the animated cartoon "Maya Bee". Alize "Softy" yellow, hook №2,25. The marker of the beginning of the row passes along the edge of the palm for the left foot and on the opposite side (near the thumb) for the right foot. We fill the palm with filler, fingers can not be stuffed. Next, both legs are knitted equally. Fill the handle with filler. In the opening of the 32nd row, insert the mount (I have 15 mm). The toy is knitted in a spiral, without connecting posts and lifting loops. Description of the knitting of this toy is made on the basis that the beginning of the row during the knitting of the whole piece is not displaced and passes a straight line, but since we knit in a spiral, without lifting loops and a connecting column, the beginning of the row will be shifted to the right, 5 rows need to be tied at the end of the row with an additional offset bar so that the beginning of the row is again in the same place. These additional columns in the description of the rows are not taken into account. We fix the thread and cut it. Alize "Softy" yellow, hook №2,25. The marker of the beginning of the series runs along the middle of the heel. You can cut out a dense plastic insole in the shape of the sole and then put it into the foot. We fill the foot with filler. Fill the leg with filler. In the opening of the 38th row, insert the mount (I have 20 mm). We fix the thread and cut it. We knit the second leg in a similar way. We begin to knit a black thread. The marker of the beginning of the series runs along the middle of the back. Mark holes for fastenings with a contrasting thread. Note: when knitting textured yarn very often have to knit touch, as the eyelet on such a canvas is very difficult to see. To reduce the time for bandaging (if an error is made), you can use an additional marker. When the series gets big enough, I put the second marker that marks the middle of the row. If desired, you can mark every third or quarter of a row. We change the thread to yellow, black is not cut off, freely stretched along the wrong side along the yellow rows upward, to the next black strip. We change the thread to black, yellow is not cut off, we freely stretch along the wrong side along the black rows upward, to the next yellow strip. We insert the fastenings of the legs into the holes of the 11th row, click it. Note: plastic fasteners are difficult to snap, but there is one trick - lower the mount for 5 minutes in boiling water, it will become softer and there will be no problems with fixing. Change the thread to black, cut yellow and fix it. We insert the fasteners of the handles into the holes of the 41st row and snap it. We fill the body with filler. We fill it to the end. We insert the head support (I have 35 mm). Unfortunately, I did not have a plastic fastener, so I used a pintle with a plywood disk. We clip the thread, fix it. Alize "Softy" yellow, hook №2,25. The row start marker in this part can not be aligned. We insert the fixation of the body at the beginning of the knitting of the head, click it. Fill our head with filler. We fill it to the end. From the yellow felt we cut out the preparations for the wig. We will need 11 parts No. 1, 2 parts No. 2, 3 parts No. 3 and 8 parts No. 4. Apply the part number 1 to the head, outline the location and pin the pins. Sewing thread in the tone sew the part to the head. Leaving 2-3 cm short, fill the resulting strand with filler. Sew the hole to the end. In the same way we sew 4 more details of No. 1 on the perimeter of the head (only 5 strands). We begin to form a line of growth of "hair" on the face. Sew two more parts number 1 on the left and right side of the face, stepping slightly up from the already sewn parts. Again, we step back a little and sew up 2 parts No. 2, from the left and right side of the face. The top of all the braces "tends" towards the center of the head (last row). Fill the remaining space on the back of the head, sewing 4 parts No. 1. We sew 3 parts №3, forming a stick out of them, add 2 more details №4 to the back of the head, in arbitrary places. From the remaining 6 parts No. 4 we sew individual, standing strands on the crown: we apply 2 details with faces to each other, we sew, but not to the end, we turn to the front side, add a little filler, sew up the hole. In the same way we sew 2 more strands, we sew them to the vertex. Cut out the pattern for 3 details for the wings - 2 pieces of white fleece and 1 piece of foam rubber. Padding between the details of the fleece, we sew the wings over the edge along the entire perimeter, grabbing both fleece and foam rubber. The thread is fixed, cut off, leaving a small tip for sewing. We start to knit a thread Alize "Softy", yellow color, hook №2,25. Fill the resulting ball filler. Change the thread to cotton black, hook number 1.5 and knit 6 cbn (no increase or decrease) until the total length of the cirri is 13 cm. Cut the thread, leaving a small tip for sewing. We insert a senile wire into the antenna. The second mustache is knitted similarly. We sew the antennae to the head. We sew wings to the back of the bee. Paws, body, nose and antennae are knit as well as in Maya. Wings do the same. The parchment is made of three separate parts. "Paula" from Richard Simon is brown, hook №2,25. The row start marker in these details can not be aligned. The thread is fixed and cut. We knit the second such "hair". We cut the thread, leaving a small tip for sewing. First we sew three parts together, placing them on top of each other, a longer string in the middle. Then sew the wig to the head, placing it slightly under the slope. Sew a spout, stuffed with a filler. From white felt we cut out two mugs (for Maya) or two ovals (for Willie) - these are the whites of the eyes, sewn. We embroider the mouth, Willie embroider the brow, sew the eyes. You can lighten the cheeks a little and the upper contour of the eye.